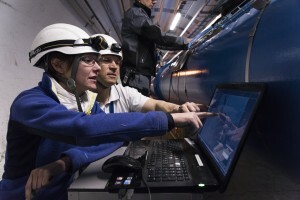 It is exciting to watch the LHC operations team slowly switch the machine back on step by step, encountering problems, solving them, encountering new ones and still breaking records while getting the machine running again. It is also educational. When the linear collider goes into operation it won’t be at the push of one button either – it’s a long and arduous process. Commissioning of the LHC for operation at 6.5 TeV has not been without challenges so far. Firstly, during training to their nominal field, a short circuit developed in one of the magnets. Detailed measurements showed that the short was located in a one of the diodes which protects the magnets in case of a quench. It was found that it was due to a piece of metallic debris lying across the terminals. Fortunately a historical relic helped to resolve the problem. The original design of the quench protection system foresaw the use of epitaxial diodes. They were the only ones available at the time but they were weak in a high radiation environment. They would need to be periodically “regenerated” by applying a reverse bias on the diodes. With this in mind, an extra current lead was included which became redundant when special diffusion diodes were developed which did not suffer from this weakness. The resourceful team responsible for the quench protection system realised that this lead could be used to apply a current pulse through the offending object to vaporise it and remove the short circuit. 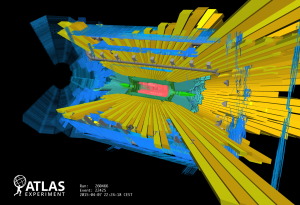 This was shown to work perfectly, adding another useful tool to the bag of tricks needed to keep the LHC running. The next problem was found with the circulating beam. It quickly became clear that there is a restriction in the aperture in one of the magnets, with an object lying on the bottom of the vacuum chamber. However, orbit bumps allow the beam to stay clear of the restriction and it should be possible to operate the machine under these conditions. Finally, something already seen in the previous run but now much more sensitive to magnet quenches at the higher field, was the appearance of so-called UFOs, unidentified falling objects which pass through the beam periodically, producing sufficient loss to quench a magnet. The operations team thinks that these are due to “air” condensed on the surface of the beam screen which is cooled to about 20 K. Warming the beam screen up to about 80 K releases the molecules which are then cryo-pumped through holes in the screen by the 1.9-K surface of the vacuum chamber behind it. So far, this has proved to be effective in fixing the problem. In spite of struggling with the reliability of primary services, water and electricity, the operations team is doing a heroic job in bringing the LHC back on for this exciting run at the energy frontier. The experiments are eager to their hands on the first data from collisions at 13 TeV, expected for this summer. Whatever they see will be essential guidance for the ILC. Want to know more? Read these updates from CERN about the fixing of the short circuit, the first beam in 2015, the first beam at 6.5 TeV, commissioning and first collisions at low energy.